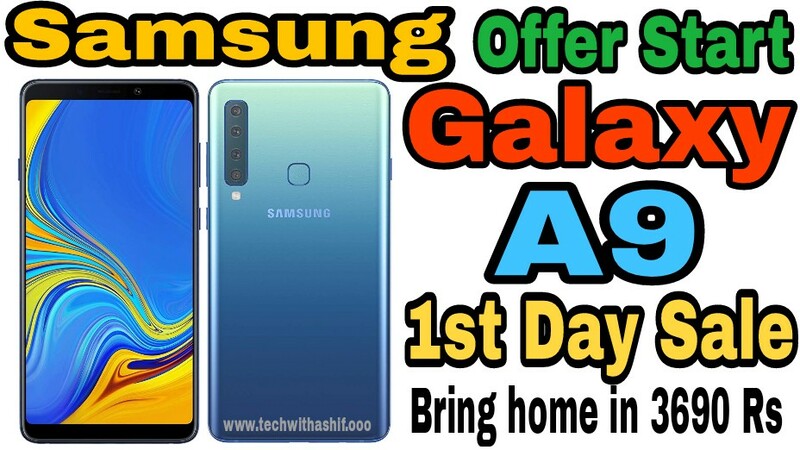 Samsung's recently launched Samsung Galaxy A9, a company that produces South Korean smartphone and electronic products, is being launched for sale for the first time today. The special feature of this smartphone is that 4 cameras have been provided in the rear. You can also buy this smartphone from Amazon, Flipkart, Samsung Online Store, Airtel Online Store and other stores than Paytm Mall. Let's know, from the price of this smartphone to launch offers. Samsung Galaxy A9 (2018) will be a direct hit from Oneplus 6T. In India, the price of OnePlus 6T is Rs. 37,999. The A9 phone's 6GB RAM variant is priced at Rs 36,990, while the price of 8GB RAM variants is Rs 39,990. Talking about the launch offer of this smartphone, a cashback of Rs. 3,000 is being given to HDFC Bank Credit or Debit Card users. Samsung Galaxy A9 6GB RAM variants can take you home at the down payment of Rs 3,690 from the Airtel online store. After that you have to pay an EMI of Rs 2,349. At the same time, you can take home the 8GB RAM variant at a down payment of Rs 4,890. After that you have to pay EMI of Rs. 2,449. Plus, Airtel users are being given Unlimited Calling and Data and Airtel TV subscriptions as well. This phone is available in Caviar Black, Bubblegum Pink and Lemonade Blue in three color variants. Galaxy A9 2018 Four cameras are its biggest feature. It has 24MP primary sensor, 10MP telephoto lens with 2X optical zoom, 8MP ultra-wide 120 degree lens sensor and 5MP sensor for depth effect. Its front camera has been given 24MP. In the case of specifications, the phone has been given an 18.5: 9 aspect ratio with a 6.3-inch Full HD Plus display. The phone has a 6GB / 8GB RAM and 128GB storage with Qualcomm Snapdragon 660 processor. Storage can be increased to 512GB with the help of MicroSD. The phone comes with Android 8.1 Oreo OS with 3800 mAh battery. In it you can store up to 320 movies together. OnePlus 6T has a 6.41 inch AMOLED display. Its pixel resolution is 2340X1080. Aspect ratio is 19.5: 9. The display of Corning Gorilla Glass 6 has been given on its display. This phone is equipped with Qualcomm Snapdragon 845 chipset. It works on Android 9 Pie. The skin of the oxygen OS is given on it. Boost mode is given in the phone, which takes 20 percent less time than other phones to load the app. OnePlus 6T has a dual rear camera. Its primary sensor is 16 megapixels. It has Sony IMX519 sensor with f / 1.7 aperture. At the same time, a 20-megapixel secondary sensor with the Sony IMX376K sensor and f / 1.7 aperture has been given. Also there is a 16 megapixel front camera with Sony IMX371 sensor EIS and f / 2.0 aperture. 4K video recording can be done in this phone. It has a 3700 mAh battery. The company claims that A9 has 23 percent more battery backup than OnePlus 6.